New Goodies Arrival from Stampin Up! One of the things I love about Stampin Up, is how quickly the orders arrive. I placed an order for some stamps, ink and card last Friday and this morning a lovely box of goodies arrived. I have orderd three colours of card for soap boxes, circle punches, some ink and the stamp set called “Mixed Bunch” which is perfect for layering. 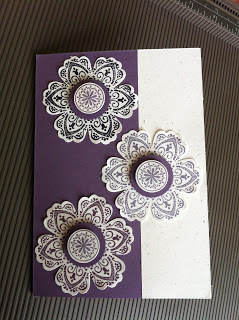 There are three large flower stamps and three smaller decorative circles. I think it is a beautiful set and have a feeling that this will be well used.